Whether for great or disastrous reasons, the environment has been a relatively hot topic in local media coverage in the past few months (at least compared to coverage in the past). From the restoration of a 19th century farm reported on by The Cincinnati Enquirer, to an in-depth, multimedia look at the aftermath of the Queen City barrel fire from WCPO.com, it’s clear the environment is becoming more of a priority for news coverage. Even in unfortunate cases such as the Duke Energy diesel spill that sent a slurry of fuel down the Ohio river, the event also sparked a slurry of news coverage across newspapers, computer and television screens both locally and even nationwide. And while no one would ever wish an environmental disaster such as this, to some extent it is relieving to see that at least when it does happen, the media is there to open up a discussion on the impacts of the event, how it came to happen, future avoidance, etc. Still, many social media users, bloggers and coffee shop talkers have argued that coverage should be greater or (for those who don’t believe in the importance of environmental reporting) even less. Below is a recap of some of this local environmental coverage from the past few months. Be sure to check back to The Northerner Green Beat’s #northernergreenbeat Twitter feed or simply follow the hashtag on Twitter for a curated list of environmental stories that affect you locally, nationally and globally. In the meantime, I’ll work on producing more environmental coverage of issues taking place here at Northern Kentucky University. NKU’s Center for Environmental Restoration, Kentucky State Parks, the Kentucky Heritage Land Conservation Fund and the U.S. Fish and Wildlife Service purchased the Piner Family Farm in Union, Kentucky last year. They paid a little over $1 million for the farm with the goal of restoring the farm environmentally. The majority of the work will be done by NKU’s CER and students from the university. As thousands of gallons of fuel spilled out into the Ohio river near Cincinnati, Ohio on Aug. 25, local media rushed to the scene to cover the incident, its cause, cleanup endeavors, future means of prevention and more. Media outlets such as WCPO followed up on the story, updating as more information became available. The Enquirer featured the Enright Ridge Urban Eco-village, giving the tristate a deeper look into the Price Hill community’s daily, sustainable lives. Many community members weren’t aware that this community thrived just minutes from downtown. Members of the Eco-Village work together to live their lives in a more sustainable fashion by doing things such as growing their own foods, composting, using solar power, building rain gardens and more. In 2004 Queen City Barrel burnt to the ground. Ten years later, WCPO tracked the effects the industrial-container recycling business had on its neighborhood and surrounding areas—including various health effects that have been linked to the industrial air pollution. Google has failed me. Then again, maybe its not Google’s fault I couldn’t find what I was looking for when I searched for college newspaper coverage of the environment online. Rather, I guess I should blame my troubles with finding considerable amounts of college media coverage of the environment on those media outlets themselves—and maybe on the shrinking amount of environmental content in national media outlets (who influence those college media outlets) as well. In fact, with only three percent of its newspaper’s coverage (according to the subject of its headlines) rooted in environmental coverage, the HuffingtonPost.com is the most ‘green’ nationally prominent news outlet in America, according to a study by greeninthemedia.org. And across the board, the numbers don’t look very promising. In fact, even The New York Times (a pretty liberal newspaper with a large amount of science coverage) recently cut their environmental news desk in its entirety —promising to still cover the environment, simply blaming the move on structural changes. However, it’s really no secret that coverage of the environment is declining. Within the transition from print to a more digitally based age, shrinking budgets to cover reporters’ salaries, have some news outlets just struggling to cover the basics. So, it wasn’t really a big surprise to me when I pulled up Google to do some searching for the best multimedia environmental news coverage at public universities across the country, and I really couldn’t find much. Regardless, an article out of Romania explaining the possibilities of new media within science journalism seems promising. It states that the interactive possibilities that new media or multimedia journalism allows could be a key to solving the lack of interest or understanding that readers may have with scientific (or environmental) communication. This could be key to a successful future of science communication, as proved by some bigger news media outlets projects listed below. However, those possibilities seem to still be on the cutting edge of journalism. So as of now, I was just able to find a few, but still really great examples of environmental journalism from larger media outlets, and also a few good things from college or university news outlets. Below are links to some of these examples. The Seattle Times Sea Change Project– The Seattle Times does a pretty decent job of covering environmental stories on a regular basis. However, with their Sea Change project they really took things to an incredible new level. This project covers a wide range of environmental topics, taking full advantage of online and digital possibilities. This website is great and uses new media tools to its full advantage through presenting captivating video visuals, simple and educational video info graphics, interactive charts and much more. I showed this project to my parents, who really have no special interest in science and even they were amazed by the project. o Northerner takeaway– Use digital tools to display strong, naturally alluring visuals to capture audience’s attention. Use digital tool of interactivity in things such as info graphics and quizzes to simplify scientific concepts and help breakdown barriers within scientific communication. The Guardian’s The Great Barrier Reef: An obituary– The Guardian Environment page is incredible in its entirety. As per usual with anything related to The Guardian, there is thorough and in-depth coverage using great photos, lots of data, etc. There is also just an incredible amount of environmental coverage on The Guardian’s page in general; I was blown away by the amount of interesting stories I found. Not to mention, there are blogs on specific subtopics of the environment on their page, and even some blogs there on how the environment affects business. More specifically, The Great Barrier Reef project that The Guardian did was incredible due to its use of many of the same technologies as The Seattle Time’s Sea Change project. The interesting subject with a very far-reaching impact and beautiful visuals really drew me into this project. Also, the beautiful and interesting narrative language used in the text part of this story really drew me through the entire experience. o Northerner takeaway– Use the far-reaching impact that environmental issues have as a way to drive reader interest. Don’t be afraid to combine digital design elements with narrative style writing to create a very interesting and appealing audience experience. The Huffington Post Green’s Keystone Pipeline Map– As stated earlier, The Huffington Post Green section is really a leader in environmental coverage in the US (as it pertains to the amount of coverage at least). I was again blown away when looking at their website and seeing how much they dedicate to green and/or environmental issues. Something I think is interesting about The Huffington Post’s Green site is their amount of social media presence and their use of digital tools in even just smaller stories. For example, the page I linked to above is to a story about the Keystone Pipeline and instead of just telling the story in a usual, textual way, the website used an interactive map of the pipeline to show how people along the pipeline’s path would be effected. It is a really cool way to show of how just using these new tools within even smaller stories can be very effective. o Northerner takeaway– Don’t reinvent the wheel. Technological and digital tools can be used in even the simplest of ways, if you just think innovatively at the most interesting and telling ways to tell a story. The Daily Orange’s News Section– While I found that not many college or university news organizations (as far as I could find) have a lot of environmental coverage, I was able to find some. I was able to come across this fascinating profile piece on a grad student who uses his bike as a deliveryman at Jimmy John’s. It was interesting to see how the video version of this profile literally offered you a peek into this man’s unusual activities in his hopes of creating a more sustainable food-delivery culture. o Northerner takeaway- When it comes to unusual experiences, sometimes video is the most efficient and effective way to give your reader a glimpse into the life of someone else. Seeing and hearing the man’s story had a more far-reaching effect on me as an audience member and I think that connection is of the utmost important in this kind of reporting on environmental issues. The Daily Tarheel Letter to the Editor– While there wasn’t an overwhelming amount of environmental editorial coverage that I could find that incorporated a lot of technological or digital tools, I did find this letter to the editor that was posted online. And, to be quite honest this got me thinking. A key to effective scientific journalism (at least for what I have found) is in audience participation and interaction. Digital transformations in the news media have almost killed off the need for a letter to the editor. Nowadays you can email or even just use social media to get your views across to an organization. And this is good, because it allows for easier and more fluid audience interaction that I could see as important in allowing non-scientists interacting with science coverage and breaking down the boundaries of science communication. o Northerner takeaway– Environmental issues affect everyone, but as a scientific topic can be somewhat uninteresting or distant to your audience due to the elevated complexity of the subject. Allowing interaction and dialogue between your audience and the subject matter is the best way to allow everyone to see that it affects them, as well as breaking down that barrier between complex science and everyday communication. From the green roof on Griffin Hall, to a center paving the way in environmental education of local P-12 educators, a once thought-to-be concrete jungle of NKU has turned out to be a world alive with green initiatives. NKU’s first LEED Certified building Griffin Hall. The building is equipped with a green roof to help with water run-off and heating/cooling. But what does being green really mean and are these initiatives enough? Follow me as I make the journey in discovering the answer to these questions and more– through my blog The Northerner Green Beat. This “beat” will feature coverage of all things green at NKU. And no, I’m not talking about the color. I mean “all things green” as it pertains to the environment and how it affects the people, places and things we encounter everyday as part of our NKU community. Below is just a sampling of my initial research into the environmental world at NKU. Read to check out what’s going on. Some of it may just surprise you. 1. Are our cars killing NKU’s carbon footprint? About 87 percent of NKU undergraduates drive themselves to campus– and that doesn’t even count faculty and staff, according to NKU Office of Institutional Research. The cars we drive leave a huge trail of carbon dioxide behind and it’s this very trail that is responsible for about 42 percent of NKU’s total carbon footprint, according to NKU Green Co-Director and Campus Planning Coordinator Jane Goode. NKU Green Co-Director and University Planner Jane Goode. Photo courtesy of NKU. All of this comes despite NKU initiatives such as NKU U-Pass which gives all NKU students, faculty and staff free fare on TANK bus routes. NKU’s President’s Climate Commitment Task Force sent out a survey to students, faculty and staff this past week to assess NKU’s current commuter carbon footprint. The survey aims to get a general estimate of how many people are commuting, how far they are commuting, their gas usage, etc. Prizes will be awarded to eight lucky students who complete this survey, according to Goode. NKU Biological Sciences Professor and ECOS Adviser Kristy Hopfensperger. Photo courtesy of Hopfensperger. Faculty, staff, and even some students are making strides to help reduce our university’s impact on local water. Last year a team of students, with help from faculty members, at NKU participated in the U.S. EPA’s Campus RainWorks Challenge which asked colleges and universities across the country to “propose transformative additions to the campus landscape that would reduce stormwater impacts,” according to Kristy Hopfensperger, NKU biological sciences professor and Environmentally Concerned Organization of Students adviser. Although NKU’s team doesn’t know if they’ve won yet, Hopfensperger said the project and its finalized plans, including pervious concrete and water bank usage around parking lots, spread some excitement about the different green opportunities that are available for future construction projects at NKU. All these water initiatives and we still have a funky green-colored Loch Norse? But that’s a different issue. NKU new media art professor Brad McCombs is spearheading a project called the Driftwood Institute aimed at naturally beautifying and shoring up a portion of the Covington, Ky., riverbank. The project, once okayed by Covington City officials, will take driftwood from the area along the Ohio River and use it to construct art in that area, with the mission to educate people about varying water issues. 2014 NKU Graduate, former ECOS president and Interim Director for NKU’s Center for Environmental Education Rosie Santos. One of these main questions, according to Santos, is how to get more students involved in these issues, rather than just faculty and staff. Because, as she said, sustainability cannot be just an individualized goal. As a part of her role, Santos is currently working on a project where she has given out Environmental Education Faculty Infusion Grants to professors and students who are coming together to create and teach interdisciplinary courses with environmental focuses. Santos said this kind of educational experience could help get students thinking more about the environment and how it relates to other fields of work and study. Guides, textbooks and other resources fill chests that local teachers can check out from NKU to help make their traditional classes more green. These items present themselves as just a few of many resources that Rosie Santos said are available at the Center for Environmental Education to loan out to P-12 classes across the area– to help make students more “environmentally literate” at an early age. Along with these chests, the center offers workshops, field trips, grants and more as a part of its state-mandated work to educate educators across the northern part of the bluegrass state, Santos said. This center isn’t new to NKU, but Santos said it has “gone under many changes as of lately.” According to Santos the center will soon be branched within the College of Arts and Sciences, where Santos is working on a 5-year plan that will align the work of the center with that of the state of Kentucky’s regulations and of NKU’s new strategic plan. 6. Simple things could amount to a lot? About 95-98 percent of cleaning products used at NKU are considered “green products,” according to NKU Green Co-Director and University Planner Jane Goode. 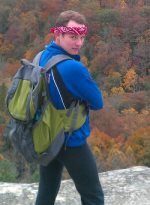 NKU senior sociology major, ECOS campus recruiter and NKU’s Center for Environmental Restoration Field Technician Luke Freeman. 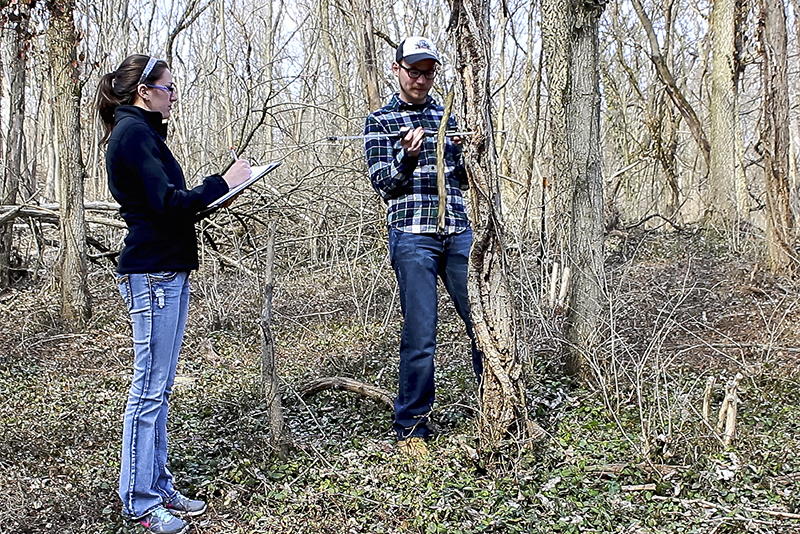 Luke Freeman, NKU senior sociology major, ECOS campus recruiter and NKU’s Center for Environmental Restoration field technician, agreed that changing the simple things in everyone’s everyday lives is a nice starting point. 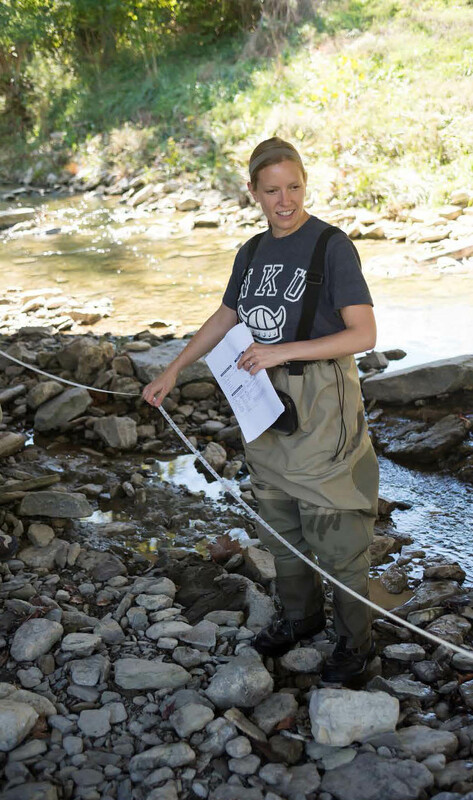 The course is an environmental science course where Curran asks students to become actively involved in seeking out immediate environmental issues, understand why they are issues, and think up the most effective ways to take care of the problems through innovation and scientific understanding. As the first state-funded Kentucky university to sign the American College and University President’s Climate Commitment, NKU is working diligently toward reducing and eventually eliminating its greenhouse gas emissions. The pledge, signed by former NKU president James Votruba, has the more long-term goal of making NKU a carbon-neutral and completely sustainable campus. Currently 15,325 pounds of material are collected on campus each day, according to NKU Green’s website. 70 percent of which could be recycled. That’s equal to the average weight of 4.7 cars. Comparatively, only 1,400 pounds of material are currently recycled in that same amount of time on campus. More information about NKU’s carbon footprint, green tips and more can be found at their website. If you’ve been at NKU for any amount of time at all, you’ve probably seen or at least heard of the large pile of trash stacked together in the center of the University Plaza once a year as a part of NKU Green’s Mount Trashmore project which aims to reveal the amount of trash NKU actually uses in a given day. Last year the mountain of trash amounted to 15,890 pounds. A past Earth Day celebration in NKU’s main plaza. Courtesy of NKU Green. 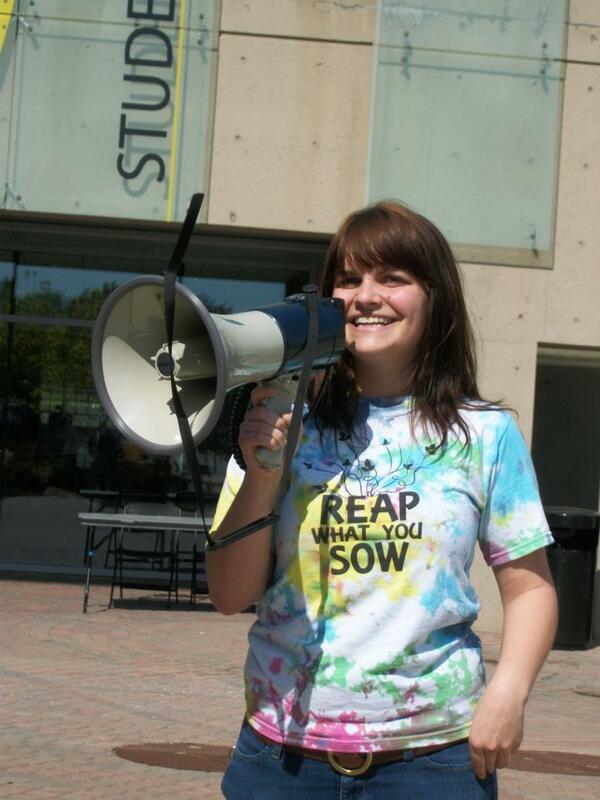 NKU Green is also responsible for different events each year such as the now week-long Earth Day celebration which aims to get the entire campus community thinking about green issues and sustainability and what you can do to help out. Past Earth week events include group film viewing and community gardening seminars. This year’s events kick-off the week of April 20. Click here for more information. 10. 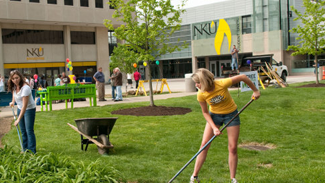 NKU paving the way to a greener future? As we speak NKU is literally paving its way to a greener future through more environmentally friendly construction projects, such as the possible use of geothermal heating and cooling in the university’s plans for its new campus recreation center. NKU has also implemented the use of things such as green roofs with its construction of Griffin Hall and the recent reconstruction of the roof of the central receiving station in the recent plaza construction on campus. But even with these progressive steps, there are still many areas for improvement. 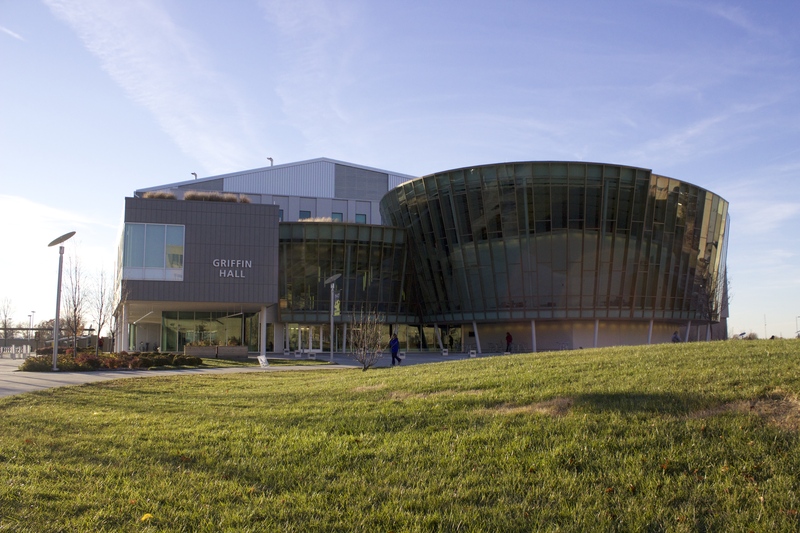 So far, Griffin Hall is only Leadership in Energy and Environmental Design (LEED) certified building on NKU’s campus. Various other renewable energy sources such as hydroelectric, solar power and more could still be taken more advantage of by NKU in its new constructions and even in its older buildings. Overall, this list barely scratches the surface. Just in the last few weeks, Greater Cincinnati officials have had to shut off our water intake due to toxic chemical spills from West Virginia and multiple news outlets in the area have reported on the detrimental impacts that chemicals like salt— used to de-ice snow-covered roads– have on surrounding bodies of water. With all these things happening, it’s bizarre to think I haven’t covered any of this in the past. But, I am definitely looking forward to writing about every last chemical spill, student research finding and pile of trash that comes along the way. If you have any story ideas you’d like to hear about or questions you’d like answered, email me at KevinESchultz@gmail.com or tweet me using the hashtag #NorthernerGreenBeat. See more of Kevin’s work at his TheNortherner.com profile. Or, click to download/view his Resume.